The plan was to depart at a time, that with our calculations would have us arrive at the straits at dawn. We didn’t want to miss or to contemplate it in the dark. Sines had a customs department so we were able to check out of the Schengen zone as we were heading to non Schengen Gibraltar. This would help us to preserve the 90 days that as Australians we are limited to in Europe. Gibraltar is a big hang out for non Europeans who are also trying to be compliant with the rules. If you would like to read more about our restrictions here is a link to our previous post on it. So we would have 2 days sailing and perhaps 3 days in Gibraltar and perhaps another 2 days sail until in Spain again. At this point we have to be in Greece by the 1st June but now we could push it back another week. 11 am was departure. The early afternoon began with next to no breeze. Although we were motoring it was lovely to be out in the still glassy sea. No swell, a dead flat sunny day. By 3 pm we were sailing in what I would describe perfect conditions. Full sails out and and 9 to 10 breeze abeam us and we comfortably doing 8 knots. It was magical this is what we were here for. Mike was in his element. He was supposed to be resting but couldn’t help himself but be out at the helm sailing. He really enjoyed the afternoon wanting to constantly trim the sails to learn more about Scout and how she responds. It was our most delightful afternoon so far and at this rate we would be at Gibraltar way before our planned time. It was calculated on an average of 5.5 knots because of the light winds forecasted on our nose and we thought we were going to have to motor a lot. So, just over a month into this sailing life and I am loving it. Apart from the obvious traveling aspects, visiting different cities, the food, speaking and understanding different languages, what I am loving the most is getting there by sail and learning a new skill. I have always loved numbers, procedures and maps and even though I knew would love the obvious wind in my hair analogy, what I have really loved more than I thought I would, is increasing my understanding of wind angles, bearings and headings, the difference between true and apparent wind speed and I love keeping a log. Every hour calculating averages- speed and remaining distance and logging our position in relationship to the rest of the world. This is our little world on this boat and it is like we exist completely independent of everything else but I love plotting and searching our location in relationship to it. That evening we made it to the point of Cabo Sao Vincente, the south western point of Portugal where we start turning east towards the Straits of Gibraltar and the Med. We had to go around 2 headlands to get on this heading and the first one we arrived at just on sunset. A beautiful majestic large lighthouse at this headland had just turned on its light as we approached. The sun was setting to our right as we made our way around the cape. I love the slow anticipated rounding of headlands, even this one as it was becoming dark. As soon we turned, lined up on our next heading, we could see the second headland and there was the full moon just rising over it. It was breathtaking! My night shift started and the wind had dropped. We dropped the sails and we became (what we fondly call it) motor vessel Scout. For the next 90 minutes I motored directly into its path. The moon straight ahead rising. It’s lit path across the glassy sea became my path to travel along. A memorable moment! Well it’s is such a shame that that path of light turned away from me as I changed course an hour later because shortly after, in the dark, that tranquility and pleasure subsided….We hit a net or fishing pot at 22.30. What a fright. A loud crash and then a sickening noise from the engine as the prop churned with something wrapped around it. There was also a loud banging as the float attached to it, was hitting the hull. Immediately Mike turned off the engine, tried it in reverse but no luck. We just couldn’t free or see it underneath. No wind, no engine, not much choice but to sit there and drift for the night and wait until daybreak- 8 hours. As a positive there was no wind, no current, no drift, calm seas and we were only 3 NM from shore. I had always wanted to go to Lagos and here we were bobbing off the coast. We may even yet have had to pull in there for repairs. We had no idea what to expect. There was a full moon to light outside and the pretty lights to light up the coast. Mike and I just took turns sleeping and lit the boat up like a Christmas tree so no one could run into us. It was a long, very gently rocking calm still night. At dawn Mike braved the cold water and dived under with his knife to cut free the rope and float from a fishing net. I was so proud of him. Not because I think others would not do. It was because I don’t think I could do it. 10 mins later we were on way again. 8 hours behind our schedule we decided to use the motor more than we had planned to and set course for the rest of the way at an anticipated 7 knots average. The culprit. What Mike cut off the propellor. We did it. The rest of the trip was fairly uneventful. I became completely paranoid about fishing nets and pots and eyes were peeled for the rest of the trip. Portugal- we loved your seafood but ahh those nets! Well it was just another challenge and obstacle to overcome. Mike awoke me from my sleep on the Thursday morning at the start of the Straits of Gibraltar. We had both been looking forward to it and he didn’t want me to miss it. The sea was choppy like bath water with currents escaping so unevenly from this narrow channel of water between two large land masses. There wasn’t as much ship traffic as I had anticipated but there was certainly one of the largest freighters I had ever seen with containers stacked about 6 high on the deck. Didn’t look too stable to me if it encountered rough seas. On our right was Africa and to our left Europe. Both continents so close. At its narrowest it is only 14 kms. The view was a bit hazy so unfortunately not much of a photo opportunity but nevertheless it was a memorable moment. Categories: cruising, neel 45, sailing | Tags: blog, cruising, cruising australians, fishing pot, neel trimarans, neel45, portugal, sailing, trimaran | Permalink. Its always exciting when we arrive in a new port. Coming around a headland, entering a river, not sure what beholds us around the next corner, excited to get off and explore… and Portugal in the 3 ports that we visited did not disappoint. Our first destination was Porto. We had been forewarned to make sure that we approached the river mouth at high tide and Mike had exactly timed our arrival for an easy entrance to the port. Sleep eyed, excited, the view as we approached the marina was grand! I knew that Porto was a city of bridges but there right in front of our marina was bridge number 1. These bridges set the scene for the rest of our visit. We walked into town, 3 kms along the river and around each corner we were amazed by the view. Porto is set up along steep banks up from the river and thus the need for these very high bridges. 6 in total. It creates a very dramatic backdrop for views and picturesque photo opportunities. Lots of tourists didn’t dampen our enthusiasm and we explored the sights and ate and drank too much seafood and wine. The highlight for me was us stumbling across a local football club bar with their verandah perched over the river and right beside the main bridge in town. It is set in a path that climbs high from the river and is entirely of steps. As you walk up the path you pass by people’s front doors, see into their lives and you wonder how these little old ladies climb up and down this path everyday to go about their lives. We said good bye to James in Porto and it was sad to see him go. We loved him being with us at the start of our adventure and we were very grateful for the help he gave us while we were finding our way with handling Scout. So we set off from Porto with just the 2 of us for a 24 hour crossing to Cascais (pronounced Cascaish). 10 minutes out of Porto and we couldn’t believe the amount of fishing pots everywhere. I suppose you can’t have all that great seafood in Portugal and not find it from somewhere. There was one about every square kilometer. The computer game minesweeper came to mind as we dodge and weaved our way out to sea. We did have an altercation with one and the noise as it scraped between two of our hulls was sickening. We decided to get out as far as possible where we could safely navigate our way south. Just out of Porto we were also joined by a group of very large bumblebees. Harmless, they buzzed around us while we were trying to get out the sails and were a real nuisance. After an hour or two of their persistence, I realised that these poor creatures had taken refuge on our boat and now there was nowhere else for them to go! They hung on and placidly sat on our deck and it was so sad to see some of them dead the next morning. I wish I had been able to do something to assist them. This sector went well, but along this coast we seemed to have either the wind right in front of us or not enough right behind us, so there was a lot of motoring. A memorable moment was when we rounded Cabo Da Roca. This is the most western point of mainland Europe and where the world believed, for many centuries from the Roman times that this was the end of the earth. Aptly named ‘Lands End’. Well, we rounded that cape and we thought we had nearly got to the end of the earth. Crazy wind change, high seas… and we bashed and crashed our way for the next few hours into Cascais. We and Scout were covered in so much salt that when washed off the boat in port it resembled a thick briny solution. Mike was absolutely exhausted and after a lengthy check in procedure at the marina, we were relieved to have arrived. Cascais is a beautiful town. A quaint city, beautifully maintained houses and gardens with interesting laneways that work their way around the inlet beaches. Lots of energy and excitement, very picturesque and it was packed – Lots of tourists. I am only glad that we weren’t there in the heart of summer. There would be no room to move. A very busy, expensive marina with, need I lament again, dreadful internet. The highlight for me was my run out along the cliffs one morning with breathtaking scenery. Our next sail was a 9 hour day sail to Sines. I think it was the first time that Mike really got to relax and enjoying sailing Scout. Not only was he becoming used to her but we had some favorable sailing winds where we could just sail for a change instead of just battling to get where we wanted to go. Mike was also becoming now more capable and relaxed with docking Scout. We arrived in Sines relaxed and high again on the adventure and thrill of what we were actually doing and what this is all about for us. We loved Sines. A small town perched high on a headland with a beach and harbour dropped down below it. So high, there is even a lift from the ridge of the city down to the beach. From the sea, you approach the two rock walls and you round the inlet into the calm, pretty, quiet harbour. Again another delightful surprise for us on entering. The weather window forced us to wait out here for 4 days and we couldn’t have picked a better place to rest. We were regrouping for our next big stage, which was going to see us do another 48 hour hop- this time to Gibraltar. My own Vasco da Gama looking out to sea from his castle birth place wondering what awaits him. Categories: cruising, neel 45, sailing | Tags: cruising australians, neel trimarans, neel45, Porto, portugal, running, sailing, Sines, trimaran | Permalink. The best laid plans ….We are still here! We have had 2 full day lessons with Alain Girard and those have proved to be invaluable. Alain has shared his systems and sailing procedures with us and we have learnt a lot about Scout and how to sail and manoevere her, both at sea and while docking. Alain has helped and advised with our rigging and given suggestions to make her safer and easier to manage. Advice on fender management and position, marks on halyards and sheets for the raising of the main sail and reefs, were all things that we had not considered and appreciate now how it will benefit us. To finish up with Alain this week, we will also be covering man over board drills and advice on passage planning. Thanks Alain and thank you also for the terrific photos and video you took of Scout during our course. My electric winch, used for raising the main sail. It would be a lot harder to raise it manually. This training though hasn’t been without a few hiccups. We have had our first ding into the dock and a finger jam by myself into a winch. Double ouch! The bump into the dock was while Mike was having his first attempt to line Scout, all 8.5 metres width of her, up on the starboard side of a dock from where she is helmed on the port side. Lack of communication and direction from crew and instructor and a tricky manoever led to our inevitable first ding directly in the bow of the starboard hull. As James said- it was like parallel parking an apartment with three steering wheels. Heartbreaking at the time, we soon accepted it and the repair was ordered. The finger jam- well that hurt a lot too and left a gash of about 2cm on my little finger and is still causing me grief but I know which one we would rather have not had happen. I won’t share the photo of my little finger, far too grisly! We had a few purchases also this week that we may not have got if we had left earlier. A Brompton collapsible bike was the most exciting. We were really dependent on our car last week for getting to the shops and this week we realized how difficult and time consuming it can be just doing day to day shopping. We have chosen not to get a water maker or a washing machine installed on Scout so even just getting bottled water back and forth to the boat from a store almost 2 kms away was proving difficult. And who would figure that a marina this large does not have laundry facilities( again an almost 2 km trek). This bike, which we have called Atticus, is perfect. It folds up to fit into one of our lockers and will be easy to get on and off our tender. Mike and I love walking and running when touring the sites in places we visit, so at this stage we have only bought one just for ease of shopping. But as mentioned before… the best laid plans…… can always change. Wednesday lunchtime ( my 52nd birthday) is our planned day this week for departure to Spain. I hope we can celebrate it crossing the Bay of Biscay. Every morning and evening Mike is looking at the forecasted weather patterns and models but we find every day they keep changing. It is going to be definitely a matter of picking it the night before because of the variables in the changing weather and swells. We certainly don’t want to be setting out on our first voyage and be crippled with seasickness and terrifying conditions. I may not return! Personally I have loved La Rochelle and have enjoyed using my french and getting used to living on board and having a bit of a routine, but it is definitely time to get going… I hope to write next time from Spain! Categories: cruising, La Rochelle, neel 45, Uncategorized | Tags: alaingirardsailing, cruising, cruising australians, sailing, to kill a mockingbird | Permalink. We have had a ridiculously busy week in La Rochelle. Where we thought we would have got a lot more sailing practise in than we did, for one reason or another, it just didn’t happen. We completely underestimated how much was involved in getting a boat equipped. The good news is that it is just about all done and next week we are really going to sink our teeth into some sailing. The week started with horrendous weather. La tempête Zeus arrived across France and left a trail of destruction in its wake. We were ok here. The wind and waves here in the marina were crazy with gust of over 50 knots. It didn’t dampen our enthusiasm, we just kept on doing the things that had to be done. Handyman Alain came and attached those things that just need to drilled and screwed into a new boat. Wifi man came and got our extended range antenna up and running. We are now able to pick up the marinas wifi, even when we are 5 kms off the coast. We made numerous trips back and forth to the shops (you could not do this without a car) and Mike has been in and out of the chandleries. Thanks to Ann at ‘Navigatlantic’, who allowed us to set up an account a few months ago and preorder a lot of the chandlery and safety equipment that we needed. It all had to be attached and a stowage place found for it. I think we have bought close to 15 storage container units and still we have lots of spare room. Our friends Joël and Sylvie arrived, abundantly bearing lots of local gifts from where they live…. and they live in Champagne! Unbelievably generous and we are in awe of their kindness. We conducted a naming ceremony for Scout and had a few laughs tossing champagne around the boat while giving thanks to Neptune and asking for kindness from the Four Winds. Sylvie and Joël had brought a special bottle labeled with Scouts name and photo. A really special visit with very good friends. I wish we had been able to take them out sailing in nicer weather. 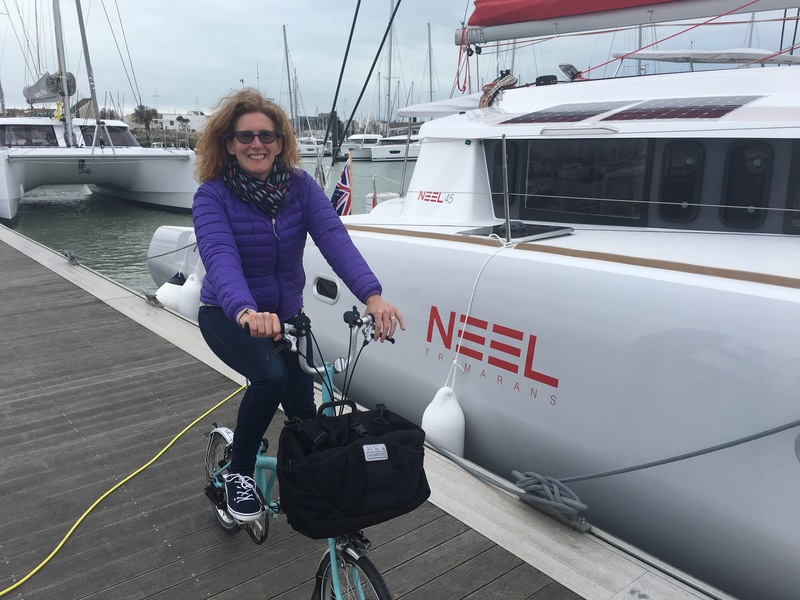 We were honoured to be invited by Eric Bruneel to inspect his new Neel 51 which was launched this week. It is the first of it’s kind and they have several more orders in place. Wow! What a difference 6 feet makes in a boat. It is huge and very luxuriously appointed! Captains and hostess’ quarters and still an additional 4 berths for clients. The area below, within the centre hull resembles a big ships engine room! Very impressive and we are excited for Neel trimarans future. Were we jealous? Not at all- impressed with the size, it would be just too big for us and our needs. 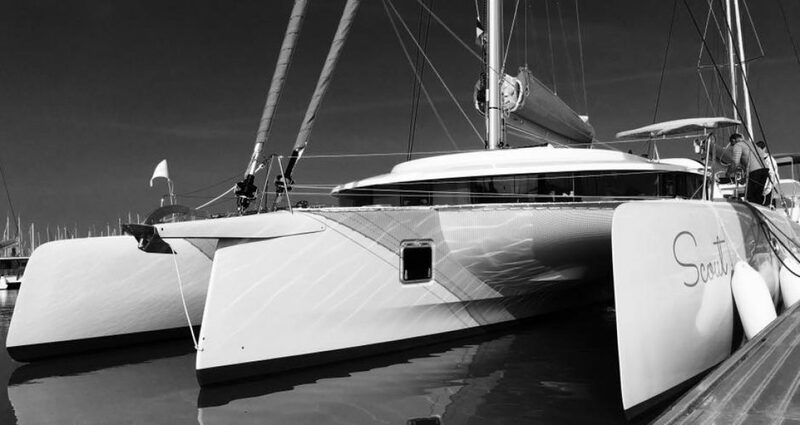 Our Neel 45 is just perfect for us…. Our son James arrived later in the week. A very exciting and anticipated reunion. A sweet moment as the train pulled into the gare at La Rochelle. Having arrived from a still very wintery Vancouver he was quick to embrace the warm rays of a very sunny day that the town blessed us with. We had a fun night out in the city centre, which felt like a balmy summers evening. La Rochelle was alive with lots of people and energy. I really do love La Rochelle. We did though, manage to get out for a few sails this week and for the first time by ourselves. Winds ranging from 20knots to todays very calm 7 knots. Each day we learn a lot! Mike is managing well and we have had some fairly difficult manoeuvres getting on and off a parallel parked dock. Setting springs to help pivot us off the dock and getting lots of advise and assistance from other anxious boat owners, who come to our aid when they see us on or off the dock. To be honest, I am sure they are terrified we are going to hit them so they are very quick to assist. We, of course, are very grateful. The outcome of our sailing week is that we are not ready yet to set off by ourselves. We are hoping to back up that which has already been learnt this week with another Alain who is the go to sailing guru teacher here in La Rochelle. Unfortunately it has been Alain’s annual leave so he has not been available until next week. Hopefully it will all come together next week. We have found ourselves exhausted at the end of the day and falling into our very comfortable bed each night, satisfied with a productive day full of new and challenging experiences. Busy brains full of plans for the next day and the growing lists of things that have to be done are slowly diminishing. We know we are closer to the stage where everything will feel just like normal routine and we will just relax into this lifestyle that we have been looking forward to for so long. Categories: cruising, La Rochelle, neel 45, Uncategorized | Tags: cruising, cruising australians, neel45, neel51, sailing, trimaran | Permalink.